We had once told you about the Bing Image Archive which is a listing of all images that are featured on the Bing.com backgrounds on a daily basis. In this article we will tell you how to automatically download the back ground images from Bing.com and set them as your desktop wallpapers or change them at regular intervals on your Windows systems. Bing4Free is not only a wallpaper downloader but also a scheduler. 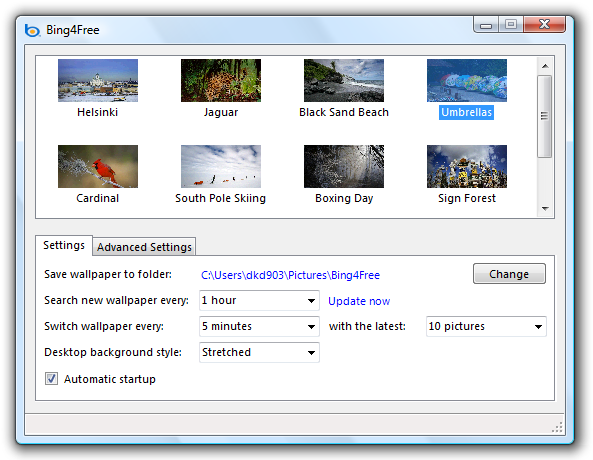 Using Bing4Free you can schedule the application to download wallpaper from Bing.com daily or hourly. The application also act as wallpaper changer which help you to change your windows desktop wallpaper. You can also set an interval for changing the wallpapers. This is really an amazing wallpaper changer application for bing.com. You can download Bing4Free from the official website. The app is very small - just 40KB worth of download. If this version of Bing4Free crashes when you run it, then you can download the older version. What is downloaded is a zip file, unzipping which gives you a file- Bing4Free.exe. You can use use Bing4Free by double-clicking this file. Here is a screenshot.